We were warmly greeted and shortly thereafter, seated to a table that provided optimal views of the restaurants beautiful interior. It was warm, cozy and spacious inside with decor that made you feel like you were eating in a quaint villa in Mexico. Tableside guacamole: Made to order and to your tastes! Fresh avocados are gently crushed with ingredients such as onion, jalapeno, tomato, salt, freshly squeezed lime juice and cilantro. Simply and so delicious with their housemade tortilla chips! Weekly Special Citrus Shrimp: This refreshing appetizer was the creation of their executive chef which consists of rock shrimp, spicy poblano guacamole all set atop a thinly sliced orange segment. Strikingly beautiful yet packed with some heat! Margarita Yucateca: And what would this delicious Mexican dinner be without a proper margarita?! This colorful libation involves hibiscus infused Cabo Wabo tequila, blood orange, triple sec, habanera simple syrup and agave nectar... olé! Now it was time for the entrees - they just kept on coming and filling up our table! Carne Asada Costena: A grilled skirt steak is marimated over night and served with specialty sauteed and seasoned cream shrimp (shrimp not shown) and served with cilantro lime rice and black beans. It was wonderful and such a great twist on a surf and turf dish! Salmon a la Veracruzana; An 8oz salmon filet is wrapped in banana leaves and served over a tomato caper Veracruzana salsa, accompanied by cilantro lime rice and caramelized plantains. Chuletas al Pastor: A grilled pork chop marinated with pastor adobo is served with a creamy tomatillo salsa, cilantro, limer ice, grilled onions and pineapple. Another weekly chef special: Mexican 'spaghetti' made with zucchini noodles seasoned with a light red pepper sauce and served with toasted bread. This makes for a low carb dish! Pollo Relleno; A breaded chicken roulade stuffed with chorizo, sweet corn, poblano, asafetida cheese... served over creamy tomatillo salsa, really asked garlic cheese potatoes and ancho green beans. This had to be my favorite dish of the night next to the chips and freshly made guacamole! Chipotle Ribeye: A well seasoned boneless ribeye toppde with mushrooms, creamy tomatillo salsa all served with roasted garlic cheese potatoes and ancho green beans. Another unique twist on steak and potatoes. And finally it was time for dessert! We were presented with a beautiful platter of three desserts consisting of cheesecake, chocolate flourless cake and flan. All were made in house and they were fantastic! After an outstanding meal, we stepped outside to their back patio... and wow. It was an awesome space perfect for outdoor dining. 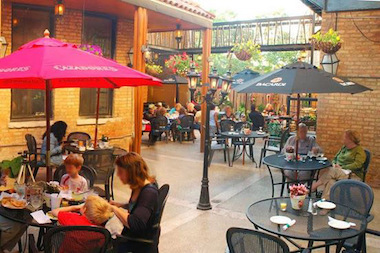 During the day, you can take in all the exposed brick, wide open season and beautifully paved patio. By night, you can enjoy the twinkling lights, soft glow of the lanterns and the beautiful and romantic ambiance. If you haven't checked out this place already, definitely make it a point to visit! 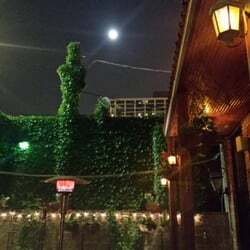 Even better is that they have 2 locations just blocks from each other in the Lakeview neighborhood! A special thanks to the staff of El Mariachi for providing us a memorable and delicious experience. 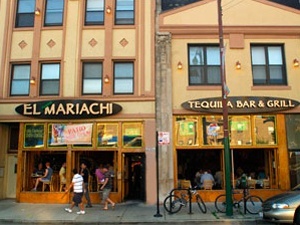 At El Mariachi Tequila Bar & Grill, they truly offer a more genuine and unique experience than the typical Mexican restaurant with an extensive selection of over 150 tequilas (100% Blue Agave), handcrafted premium margaritas, our famous tableside guacamole and regional Mexican cuisine!